Look! My square is green! NaNoWriMo got off to a fun and bountiful start for me last night. I gathered with about 40 or so members of the Portland and Vancouver NaNoWriMo regions at PDX last night, starting at 11:00 pm. The event was scheduled until 3:00 am; my friend and I left about 2:00 am. And I am happy to report that I headed home with 3,167 words in my NaNoNovel at that time. I've just spent a little more time with the same writer friend, eating dinner, catching up on non-NaNo life, talking about our novels and progress, and even a little more writing. As of right now, I have 4,203 words on my novel. That is 2,436 words over the goal for today. This makes me happy. And I might get in a few more words later tonight. After a walk and a break and stretching out my shoulders. Oh - and I already have a body. I wasn't going to write a mystery novel, with bodies and such, this year. Oh, well. The characters want to play around with a little intrigue and mystery and things that go bump in the night, I guess. I told them it was their story, so here we go! 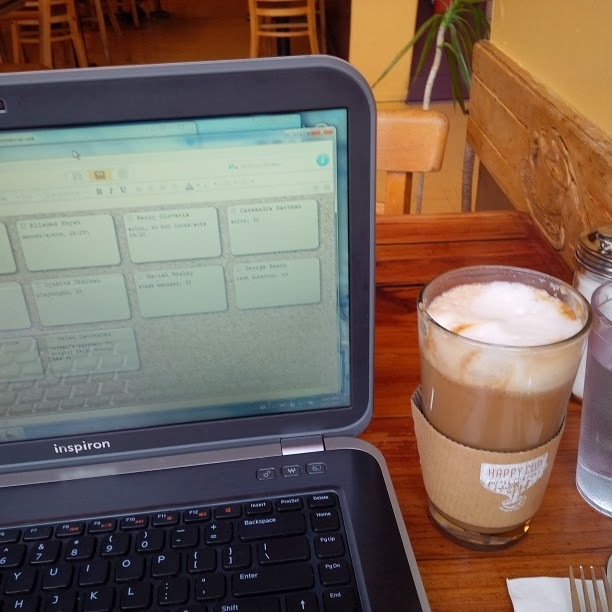 Today's writing meet up was at Cup and Saucer on Hawthorne. Good coffee, breakfast all day, wifi to update word count, and it's not too crowded. The only drawback is a lack of plug-ins - but if you know where they are and you can grab one, it's not an issue. Or make sure your battery is charged for at least an hour's worth of writing if you use a laptop. Yes, that is Scrivener on my screen. I'm giving it a go this year : typing in Scrivener. Last night I started out in Word and then transferred the document into Scrivener, dividing the chapter into three scenes. Now that I've figured out a quick and easy way to compile and check my word count, that I have my preferences set so I don't have to do it each time; I think this will work well.